In November 2018, TripActions, a business travel startup based in Palo Alto, California, reached a $1 billion valuation. The company describes themselves as a “travel platform that moves businesses forward” and a “travel agent in your pocket” for companies and their employees. Their support teams are available 24/7 on the TripActions app to solve any problems that people may encounter on the road. But in order to truly support those business travelers, no matter where their journeys take them, TripActions needed to have local teams around the world. This meant opening and staffing physical offices in strategic locations. Before taking the plunge, TripActions had some concerns. Would they be able to bring to life their unique company culture in each new location? And with the business growing so quickly, TripActions had a hard time predicting employee headcount years in advance. “Expanding into other cities beyond Palo Alto was an experiment. We were hesitant to sign a lease on a space that locked us in for multiple years,” says Nina Giovannelli, VP of business operations, TripActions. From their Palo Alto headquarters, TripActions saw San Francisco as a strong recruiting location. They moved into a WeWork office suite in San Francisco—a private space on a shared floor, with their own entrance. In just five months, TripActions was able to hire locally and grow their business from this new space. From London to Amsterdam, Sydney to New York, TripActions now has more than 400 employees worldwide. “WeWork gives us that flexibility to grow fast, without having to worry that we’re overpaying for space we don’t need,” says Rich Liu, TripActions’ chief revenue officer. The sense of community that grew from one location in Palo Alto to six WeWork locations has remained as strong as ever—along with increased employee productivity. “We actually found that the people who were coming into an office were 46 percent more productive, in terms of hitting their quotas, than people working out of home offices,” says Liu. TripActions knows that their global ambitions go hand-in-hand with maintaining their unique company culture—and WeWork has helped them reach their ambitious business goals. 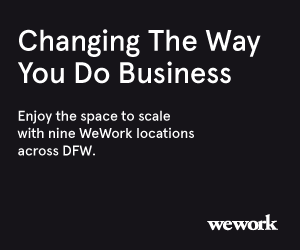 Explore your business’s full potential with 10 DFW WeWork locations. Schedule your tour and discover your perfect workspace solutions today. Dallas ranks seventh in net tech employment and sixth in jobs added among 46 U.S. metropolitan statistical areas analyzed in CompTIA's Cyberstates 2019 guide.